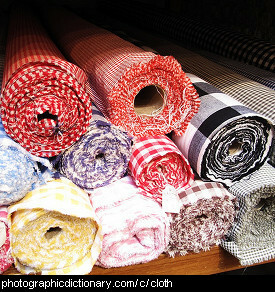 Different types of fabric, and weaves that are used to make fabric. Brocade is a class of richly decorative fabric that has the design woven into it. 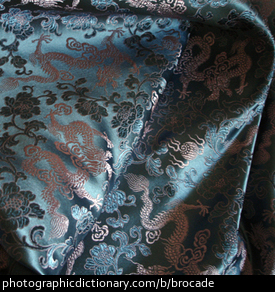 Brocades are often made in colored silks and with or without gold and silver threads. Canvas is a kind of heavy, plain woven fabric, usually made from cotton or linen. It is used to make sails, tents and other items that need to be made from strong fabric. Artists like to stretch some canvas over a frame and use it to paint on. 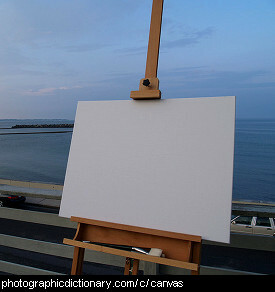 A piece of canvas prepared like this is also called a canvas, like the one in the picture. Cloth, or fabric, is a large, thin material that is made from tiny fibers connected together. Cloth is used to make clothes, drapes, some kinds of bag and many other things besides. The picture is of some long rolls of cloth. Corduroy is a type of fabric that has stripes on one side alternating between flat and slightly fluffy, which gives a ribbed effect. 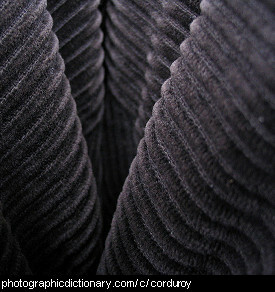 Corduroy is quite thick and is often used to make trousers and jackets. 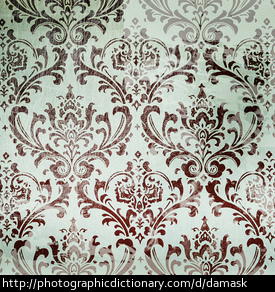 Damask is a pattern used on a variety of fabrics like silk and wallpaper. Damask patterns can come in a lot of different designs, but the most common is a damask rose pattern like the one in the picture. Fabric is another word for cloth. Fabric is used to make clothes, drapes and lots of other things. 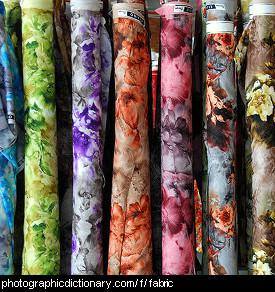 The word fabric can also be used to describe the fundamental structure of something, as in "the fabric of society". Felt is a fabric that predates weaving and knitting. Felt is made by rubbing wet fibres until they stick together in a thin, matted layer. 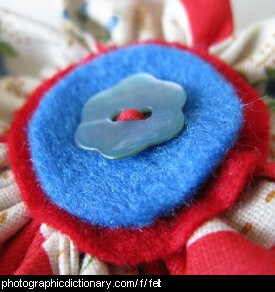 Felt is often made from wool or hairs from an animal like a rabbit or beaver. 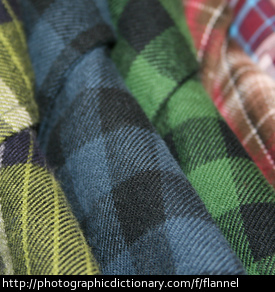 Flannel is a soft, thick fabric usually made from cotton or wool. Flannel has a fuzzy texture that makes it very comfortable to wear. 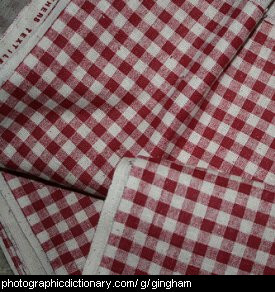 Gingham is a kind of woven fabric pattern, also called plaid and sometimes called checked, but it is not the same as a checkerboard pattern. 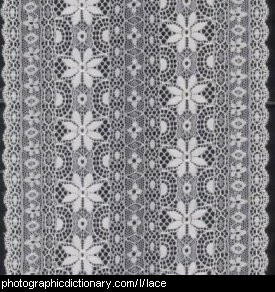 Lace is a kind of fabric that is made up of loops and holes. Lace usually has flower shapes in it, and is very pretty. It is often found on the edges of dresses.